Working with Catcher Media, I have found myself in all sorts of situations meeting all sorts of people who I’d never otherwise have had contact with. It’s completely fascinating. So, I feel I should start off by saying: I am not a football person. I have never been athletic, never came from a family who supported a team, or even watched an entire game. 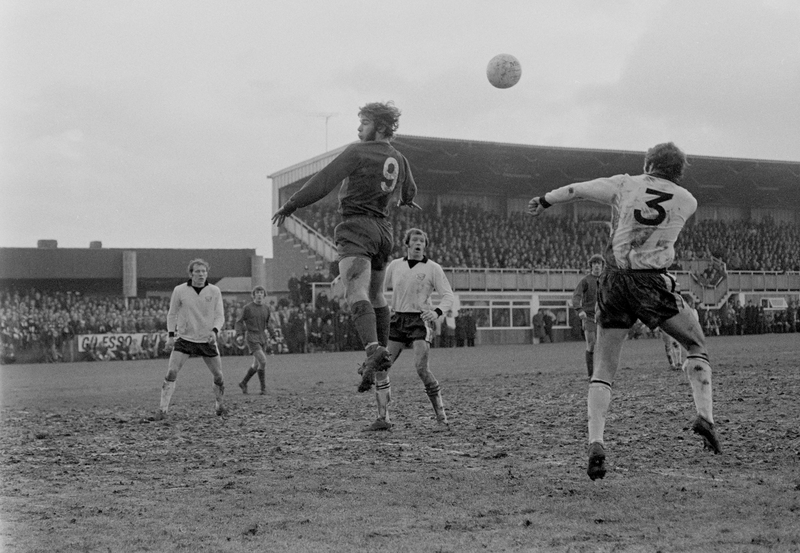 But it is impossible not to get swept up with the romance and excitement of the 1972 Hereford v Newcastle match. I am a story person, and the events of 5 February 1972 at Edgar Street make a great story. 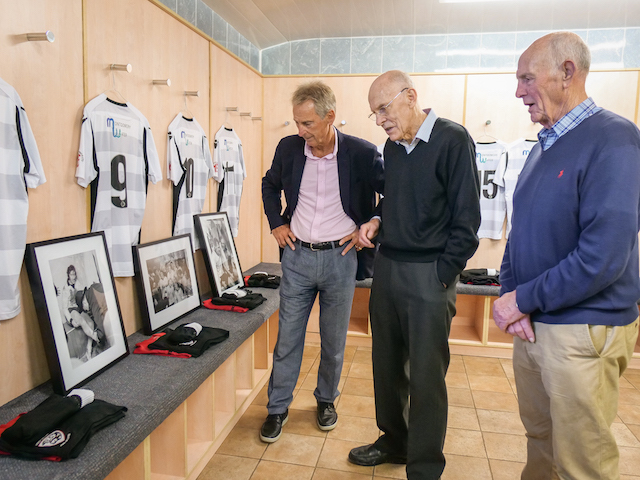 I’ve spent weeks looking through photographs of HUFC from the Derek Evans Studio Archive – black and white figures in stripy socks, pirouetting or doing the splits mid-air; like burly, mud-splattered ballet dancers. Out of this beautiful archive, I have become most familiar with the photos taken at That Match and of That Goal. 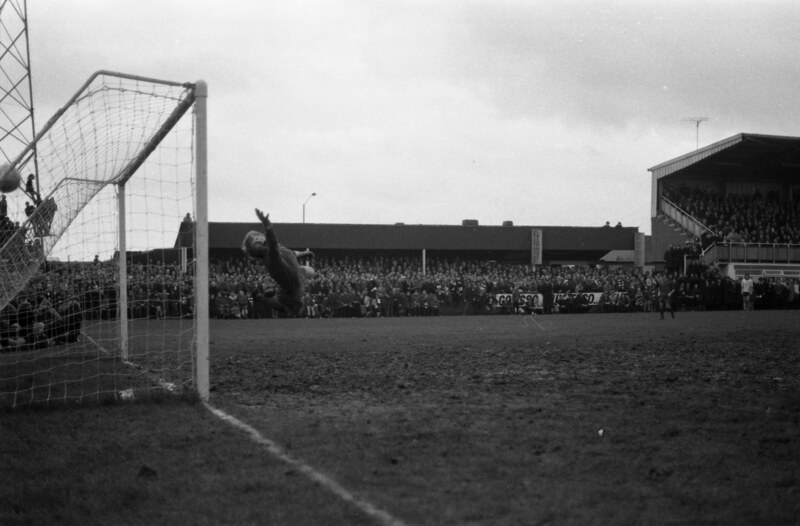 Derek Evans was there with his camera when Hereford United made football history; beating Newcastle United with two stunning goals against one. 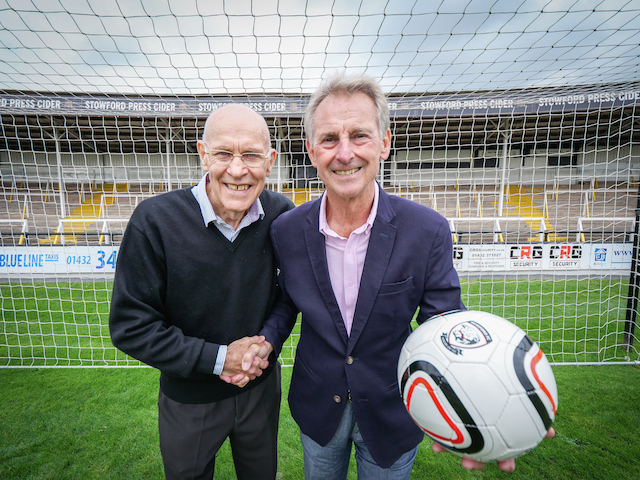 So, having grown-up without football in my life, I found myself suddenly a little star-struck to be meeting Ronnie Radford and his lovely wife Annie, Colin Addison and Peter Isaac at Edgar Street on an early October afternoon. Here were these key figures, assembled again, at the sight of their greatest moment of glory. Ronnie and Annie had travelled all the way from Yorkshire that day, making time to meet Catcher Media while they were in town - so we made sure we offered everyone a hot cup of tea before we started rolling (a daunting prospect: making tea for Yorkshire folk!). The energy in the room was buzzing, and full of positivity, as the group instantly struck up a lively conversation. Colin spoke about how they had all kept in touch – that team - all through the years, despite being spread out across the country. Ronnie said Colin had done an amazing job of organising and training the team, who came from all over, in the first place! Out on the pitch, we talked about the match: where Ronnie and been, the trajectory of his goal. We talked about Ricky George and how he had been a substitute, but when he came in and scored the winning goal in extra time all the frustration of sitting on the bench was forgotten. We talked about the run-up, the first match with Newcastle, the comments about the soggy pitch conditions at Hereford – but how the conditions at Newcastle had been perfect and we had still drawn. We talked about the electric atmosphere at Edgar Street that day, and the joyous pitch invasions. All through this, Emma Drabble was snapping photos. She was there all day on Friday to capture the day’s events and she even managed to get Ronnie kicking the ball around. Her work will be featured as part of the Herefordshire Life Through a Lens project, offering a contemporary counterpoint to Derek’s original photos. Despite spending hours together, the afternoon whizzed by and it was soon time to pack-up and go our separate ways, for now. I left wondering what it would be like to be in a packed stadium cheering for your team, the underdogs, and have them win against the odds. I think that’s an experience I would treasure for a long time too. Perhaps I am becoming a football person after all. Yes, I was there! My father was a keen sportsman, and used to support Aston Villa, being a Brummy. He trialled for them in his twenties and was offered a career, but, having a young family and only being paid if he got into the team and actually played on the day, he declined. 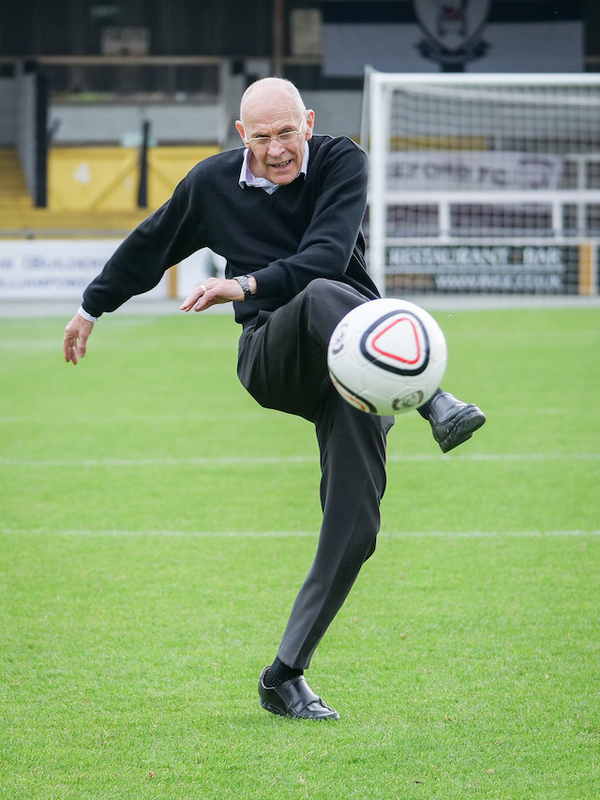 When he moved to Hereford in 1945 he started supporting HUFC, and when I was old enough, took me along with him. The day "we" beat Newcastle, the atmosphere was electric. On listening to a brief news clip that evening, I always remember thinking that the crowd sounded as if they were chanting, ".. come on Hairy Ford" ! 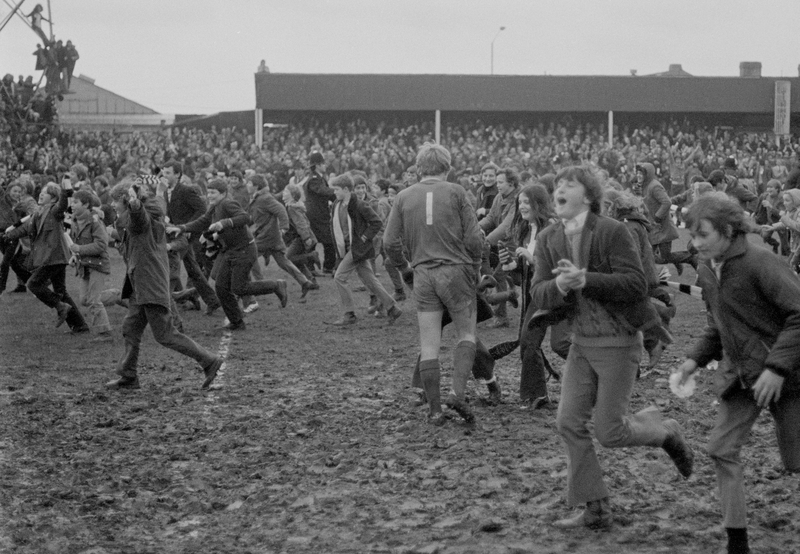 Yes, we did invade the pitch, and it was very muddy, but dirty shoes could always be cleaned later. For the next match, against West Ham, I was in the army, stationed near Andover. My father got his ticket, but I couldn't get hold of one. Never the less, being 20 years old and knowing my way around London, I took the day off and went along, joining hundreds of fans outside the ground, desperately trying to find a way in. In the last 15 minutes the gates were opened to let people leave, and those of us who could, to swarm inside. Disappointed to not have seen the match, I was gratified to see us score in the final minutes, but it was not enough. I think we lost 2 -1. On turning round to leave, who should be standing 20 feet away, but my father. I was able to guide him past the queues of "Yokels" purchasing tickets for the underground at the kiosk, and to use the self-service ticket machines. I left him on the platform as he headed home to Hereford, and I went back to Andover.